Thriller follows the rise of Mitch Rapp (Dylan O’Brien), a CIA black-ops recruit under the instruction of Cold War veteran Stan Hurley (Michael Keaton). The pair is then enlisted by CIA Deputy Director Irene Kennedy (Sanaa Lathan) to investigate a wave of apparently random attacks on both military and civilian targets. Together, the three discover a pattern in the violence, leading them to a joint mission with a lethal Turkish agent (Shiva Negar) to stop a mysterious operative (Taylor Kitsch) intent on settling a personal and professional vendetta that could have cataclysmic results. Based on the best-selling book series by Vince Flynn, with 16 New York Times bestsellers and over 20 million copies sold to date. Vitals: Director: Michael Cuesta. Stars: Dylan O’Brien, Michael Keaton, Sanaa Lathan, Shiva Negar, Scott Adkins, Taylor Kitsch. 2017, CC, MPAA rating: R, 112 min., Thriller, Box office gross: $36.249 million, Lionsgate. Extras: Alamo Drafthouse Q&A with Dylan O’Brien and Taylor Kitsch. Blu-ray adds “Target Acquired: Creating an American Assassin” featurette, “Finding Mitch Rapp: Dylan O’Brien” featurette, “Transfer of Power: Hurley and Ghost” featurette, “Weaponized: Training and Stunts” featurette, “In the Field: Locations” featurette. 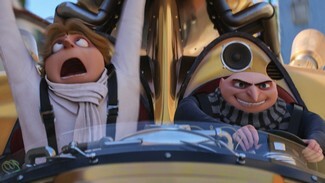 More adventures with Gru, his wife Lucy, their three adorable daughters — Margo, Edith and Agnes — and the Minions. After he is fired from the Anti-Villain League for failing to take down Balthazar Bratt, the latest evil mastermind to threaten humanity, Gru finds himself in the midst of a major identity crisis. But when a mysterious stranger shows up to inform Gru that he has a long-lost twin brother — a brother who desperately wishes to follow in his twin’s despicable footsteps — the former super-villain rediscovers just how good it feels to be bad. Vitals: Director: Pierre Coffin, Kyle Balda. Stars: Voices of Steve Carell, Kristen Wiig, Miranda Cosgrove, Steve Coogan, Jenny Slate, Dana Gaier, Julie Andrews, Trey Parker. 2017, CC, MPAA rating: PG, 89 min., Animated Comedy, Box office gross: $262.329 million, Universal. Extras: All-new mini movie: “The Secret Life of Kyle”; “Minion Moments”: more Minion mayhem with Gru; deleted scene; character profiles; “The Making of Despicable Me 3”; “Developing Dru”; “The AVL Files”: Through the lens of the Anti-Villain League’s hi-tech database, this ultra secret, interactive surveillance briefing showcases all of the agency’s amazing creations and top agents; “Freedonia Visitors Guide”: Welcome to Freedonia! See all that the town has to offer with this interactive map. From its world class cheese, to its beautiful coastline, Freedonia has it all; “Despicable Me TV”: “Despicable Me 3” infomercials. “Balthazar Bratt Action Figure,” “Bad Boy Bod by Balthazar Bratt” and “Agnes’ Super Cute, Incredibly Amazing Toy Sale”; “Doowit” sing-along with Pharrell Williams as the Minions plot their escape from prison; “Yellow Light” official music video by Pharrell Williams; “Minion Mugshots”:The Minions add to the long list of celebrity mugshots in their very own “rogues gallery”; “Wanted Posters”: Minions wanted for various crimes. 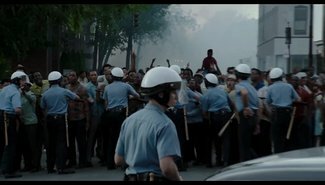 Vitals: Director: Kathryn Bigelow. Stars: John Boyega, Will Poulter, Algee Smith, Jacob Latimore, John Krasinski, Anthony Mackie. 2017, CC, MPAA rating: R, 143 min., Drama, Box office gross: $16.790 million, Fox. Extras: “The Truth of Detroit,” “The Cast of Detroit,” “The Invasion of Detroit,” The Hope of Detroit,” “Detroit – Then and Now,” Algee Smith and Larry Reed: “Grow” music video. In May 1940, Germany advanced into France, trapping Allied troops on the beaches of Dunkirk, France. Under air and ground cover from British and French forces, troops were slowly and methodically evacuated from the beach using every serviceable naval and civilian vessel that could be found. At the end of this heroic mission, 330,000 French, British, Belgian and Dutch soldiers were safely evacuated. 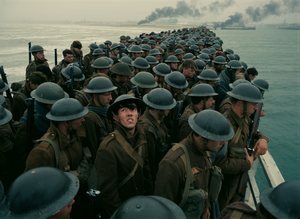 The film opens as the British and Allied troops are surrounded by enemy forces at Dunkirk. Trapped on the beach with their backs to the sea they face an impossible situation as the enemy closes in. The story unfolds on land, sea and air. RAF Spitfires engage the enemy in the skies above the Channel, trying to protect the defenseless men below. Meanwhile, hundreds of small boats manned by both military and civilians are mounting a desperate rescue effort, risking their lives in a race against time to save even a fraction of their army. Director Christopher Nolan directed “Dunkirk” from his own original screenplay, using a mixture of IMAX and 65mm film to bring the story to the screen. The film was partially shot on location on the beaches of Dunkirk, France, where the actual events unfolded. Vitals: Director: Christopher Nolan. Stars: Fionn Whitehead, Tom Glynn-Carney, Jack Lowden, Harry Styles, Aneurin Barnard, James D’Arcy, Barry Keoghan, Kenneth Branagh, Cillian Murphy, Mark Rylance, Tom Hardy. 2017, CC, MPAA rating: PG-13 106 min., Drama, Box office gross: $187.845 million, Warner. Five medical students, hoping to gain insight into the mystery of what lies beyond the confines of life, embark on a daring and dangerous experiment. By stopping their hearts for short periods of time, each triggers a near-death experience. As the investigation becomes more and more perilous, they are forced to confront the sins of their pasts, as well as contend with the supernatural consequences of trespassing to the other side. Contemporary take on the 90s film of the same name. Vitals: Director: Niels Arden Oplev. Stars: Ellen Page , Diego Luna, Nina Dobrev, James Norton, Kiersey Clemons, Kiefer Sutherland. 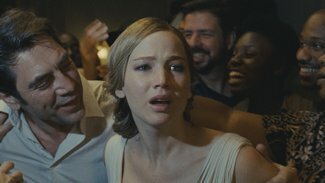 2017, CC, MPAA rating: PG-13, 110 min., Thriller, Box office gross: $16.866 million, Sony. Extras: Two featurettes:“Just What the Director Ordered,” “The Ultimate Question.” Blu-ray adds two additional featurettes: “Reviving a Cult Classic” and “Making the Rounds,” deleted and extended scenes. Recently separated from her husband, (Michael Sheen), Alice (Reese Witherspoon) decides to start over by moving back to her hometown of Los Angeles with her two young daughters. During a night out on her 40th birthday, Alice meets three aspiring filmmakers who happen to be in need of a place to live. Alice agrees to let the guys stay in her guest house temporarily, but the arrangement ends up unfolding in unexpected ways. Alice’s unlikely new family and new romance come to a crashing halt when her ex-husband shows up, suitcase in hand. A story of love, friendship, and the families we create, and one very big life lesson: Starting over is not for beginners. Hallie Meyers-Shyer. Stars: Reese Witherspoon, Pico Alexander, Nat Wolff, Jon Rudnitsky, Michael Sheen, Candice Bergen, Lake Bell. 2017, CC, MPAA rating: PG-13, 97 min., Comedy-Romance, Box office gross: $26.984 million, Universal. Extras: Commentary with writer-director Hallie Meyers-Shyer and producer Nancy Meyers.. 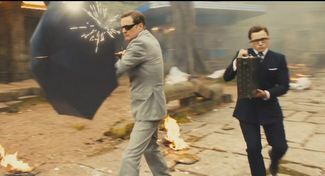 The Kingsmen face a new challenge when their headquarters is destroyed and the world is held hostage. Their journey leads them to the discovery of an allied spy organization in the US called Statesman, and in a new adventure, these two elite, secret organizations band together to defeat a ruthless common enemy in order to save the world. Vitals: Director: Matthew Vaughn. Stars: Colin Firth, Taron Egerton, Mark Strong, Julianne Moore, Halle Berry, Elton John, Channing Tatum, Jeff Bridges. 2017, CC, MPAA rating: R, 141 min., Action-Adventure Comedy, Box office gross: $99.554 million, Fox. Extras: “Black Cab Chaos: Anatomy of a Killer Chase”; Kingsman Archives: Concept Art: Sets, costumes, stills: Behind the scenes, sets, props, the cast. Blu-ray adds “Kingsman: Inside the Golden Circle” nine-part documentary. Vitals: Director: Charlie Bean, Paul Fisher and Bob Logan. Stars: Voices of Jackie Chan, Justin Theroux, Dave Franco, Olivia Munn, Michael Peña, Fred Armisen, Kumail Nanjiani, Abbi Jacobson, Zach Woods. 2017, CC, MPAA rating: PG, 101 min., Animated, Box office gross: $58.682 million, Warner. Extras: LEGO NINJAGO TV series sneak peek; · “Animation Bridge Test” deleted scene; “Baby Fight” deleted scene; “Dock Scene” deleted scene. 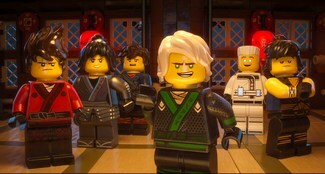 Blu-ray adds Team Supreme: Building NINJAGO” featurette; “Rumble in the Bricks” featurette; “Rebrick Contest Winners” featurette; “Which Way to the Ocean” mini-movie; “Zane’s Stand Up Promo” mini-movie; “The Master: A LEGO NINJAGO® short” mini-movie; Oh, Hush! & Jeff Lewis “Found My Place” music video; “Everybody Have a Ninja Day “music video”; “Rocktagon” music video; “Warlord Ballad” music video; “Gimme Some Outtakes!”; commentary by director Charlie Bean and crew; 13 promotional videos. A couple’s relationship is tested when uninvited guests arrive at their home, disrupting their tranquil existence. An allegorical couple — a young woman with her husband at their country home — has their life disrupted by the arrival of a mysterious man and woman. A series of disturbing events follow, turning their idyllic home into a hellish nightmare. From filmmaker Darren Aronofsky (“Black Swan,” “Requiem for a Dream”), comes this riveting psychological thriller about love, devotion and sacrifice. Vitals: Director: Darren Aronofsky. Stars: Jennifer Lawrence, Javier Bardem, Ed Harris, Michelle Pfeiffer, Domhnall Gleeson, Brian Gleeson, Jovan Adepo. 2017, CC, MPAA rating: R, 121 min., Drama, Box office gross: $17.800 million, Paramount. begins to see a changing world through new eyes and joyfully reclaims her humanity. Vitals: Director: Stephen Frears. Stars: Judi Dench, Ali Fazal, Eddie Izzard, Addel Akhtar, Michael Gambon. 2017, CC, MPAA rating: PG-13, 111 min., Drama, Box office gross: $18.249 million, Universal. and props contributed to the realism of the film.